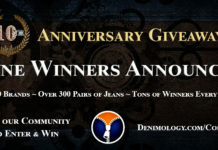 RevolveClothing is feeling very generous this month because they are willing to give away a massive $500 worth of James Jeans to the winner of the competition. That means you get yourself up to four free pairs of James Jeans which would be a great pre-Xmas present for anyone. Please note that by entering this competition you are agreeing to receive email newsletters from both Denimology and RevolveClothing. Only one entry per email address will be accepted and the closing date for entries is Dec 15th, 2009.